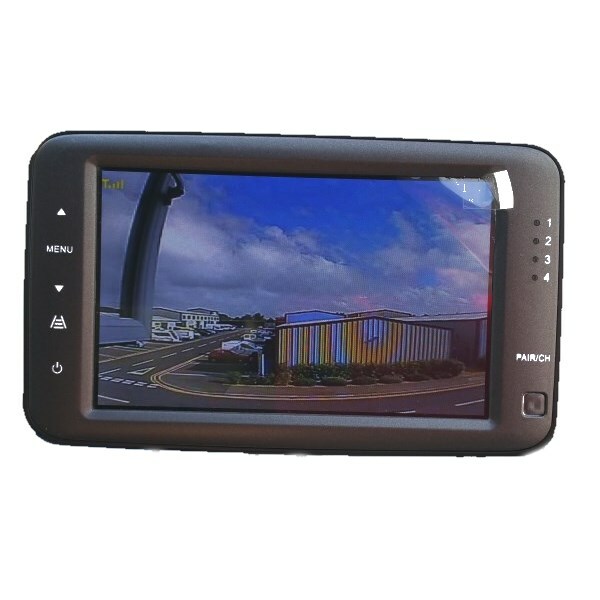 This 5 inch digital wireless reversing camera system is for people with a caravan or trailer. The 5 inch colour monitor is a suction mount one powered from a cigerette lighter plug. This means it is easily removable when not in use. The camera is a good quality CCD camera with separate LED lights for night vision. Being digital it will work over a long distance interference free. It can take up to 4 cameras and our ACC434T can be used with our current stock to add cameras to it. The camera operates from 12-32V and has a short power lead to bare connectors. The monitor mounts to the window using a suction mount. If a second camera is added you change channels via a button on the side of the monitor. It has a resolution of 800 x 480 pixels and a brightness of 400 cd/m2.